Test ride the all-new 2017 KTM ADVENTURE RANGE with the RIDE ADVENTURE KTM Demo Day! 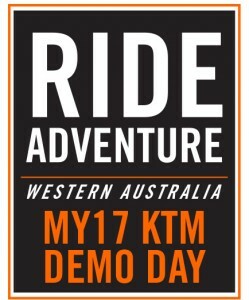 The first of its kind, Western Australia will play host to the RIDE ADVENTURE KTM Demo Day on Sunday, October 8th 2017 at a private venue near Westdale (1 hour from Perth). With the support of Savage Motorcycles, Mandurah City KTM and Bunbury KTM, the new range of KTM adventure models will be available to test in real-world conditions, on a 25-minute loop featuring onroad and offroad sections. Riders will have the chance to test ride two models, at no cost! Plus a BBQ lunch will be provided. If you have been thinking about joining the adventure family, this is the perfect chance to experience the KTM adventure models and appreciate their capabilities across a range of terrain. Experience the new definition of ADVENTURE for yourself at this exclusive KTM Demo Day! Pre-book your test rides below. CLICK HERE TO REGISTER YOUR TEST RIDES NOW!